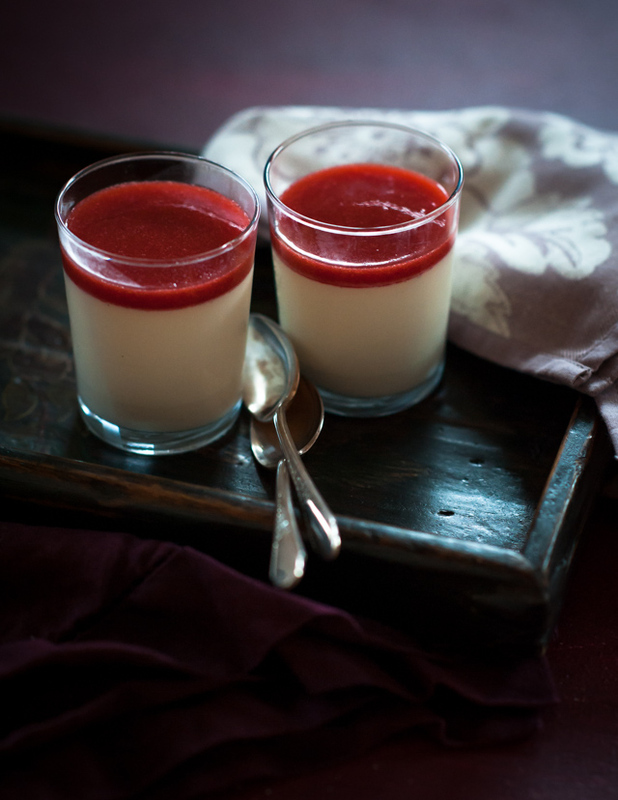 Panna cotta is one of those desserts that I just plain refuse to order at restaurants, because they're so easy and delicious to make at home! I like mine with a half-milk/half-cream mix, so that the texture is lighter and doesn't feel reminiscent of sunscreen the way that full-cream panna cottas do. But really, the name makes them sound fancier than they are! It's just milk jello, really! Life has been cray cray busy lately, so it's nice to have this blog to escape to every once in a while without the pressures of being a regular blogger. Thank you all to those of you who still have me in your blog, email, instagram feeds. I think of you all often, and wonder what magic you're cooking up in your kitchens! 1. In a medium saucepan with a lid, combine the milk and heavy cream. Split the vanilla bean in half and scrape the insides into the milk. Add the bean as well. Over medium heat, bring to a bare simmer, then remove from heat, cover with the lid, and let steep for 5 minutes. 2. Place the water in a medium bowl, and sprinkle the powdered gelatin evenly over the water. Let bloom for 5 minutes. 3. Meanwhile, add the sugar to the milk mixture. Heat and stir just until the sugar has dissolved -- it just needs to be warm, so don't let it get to a simmer/boil. Remove from heat and set aside. 4. Once the gelatin has bloomed, pour the milk mixture through a fine mesh strainer over the gelatin. Stir until the gelatin has completely dissolved. 5. Divide the milk between 8 ramekins/glasses, leaving room at the top for the strawberry sauce. Cover the ramekins with plastic wrap, and refrigerate for at least 3-4 hours until set. 6. For the strawberry sauce, place the strawberries and their juices and the chopped-up peach in a food processor. Blend until there are no chunks left and the mixture resembles a thick juice. 7. In a saucepan, combine the strawberry-peach mixture, saffron threads, and 100g of sugar. Taste the mixture briefly to make sure you like the sweetness. Add more sugar if needed. 8. Heat the mixture over medium heat, stirring constantly just until the sugar has dissolved at a bare simmer. Remove from heat and cover the saucepan with a lid. Let steep for at least 10 minutes for the saffron to infuse. Then, strain through a cheesecloth or fine mesh strainer. Chill until needed. 9. 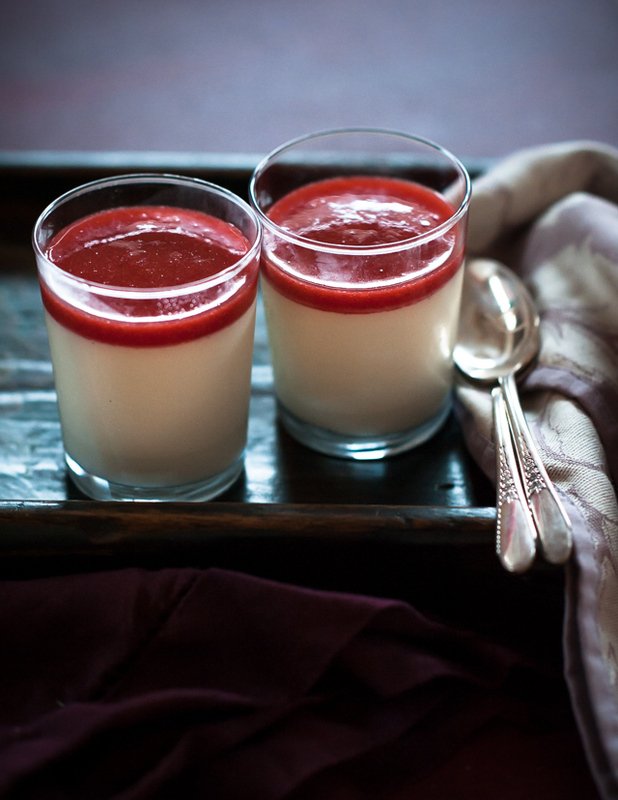 Serve the panna cottas with strawberry sauce on top.